Royals celebrate after beating the White Sox in back-to-back games. CHICAGO — Alex Gordon has never been much of a power hitter, so prolonged homer droughts don’t bother him too much. So Wednesday night was a good one. 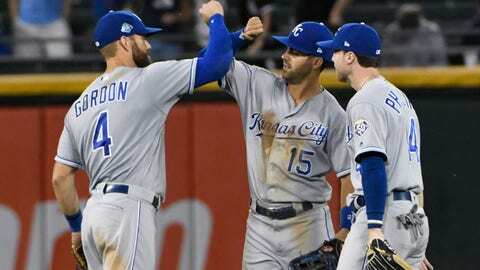 Gordon hit a two-run home run and a two-run double, leading the Kansas City Royals to a 10-5 victory over the sloppy Chicago White Sox. Gordon also walked and scored during Kansas City’s five-run fifth. Brett Phillips added two hits and Ryan O’Hearn singled in a run in his second major league game as the last-place Royals posted consecutive wins for the first time since they won three in a row from July 20-22, matching their season high. Chicago lost for the sixth time in seven games. Yoan Moncada broke out of a slump with his fifth career leadoff home run, two hits and two walks, but he also committed one of two costly errors for the White Sox. With one out and runners on first and second in the fifth, lumbering Kansas City catcher Salvador Perez hit a hard grounder to third. Yolmer Sanchez threw to second looking to start a double play, but the ball went off the top of Moncada’s glove and into right field. Another error — this one on a bad throw by pitcher Dylan Covey (4-7) — helped set up Gordon’s two-out, two-run double in the third. Covey was charged with seven runs, four earned, and five hits in 4 1/3 innings, dropping to 1-5 with an 8.89 ERA in his last six starts. Covey said he thinks he has been overthrowing a bit. “I know that when my ball is moving the best and when I’m locating it the best, I feel just free and easy on the mound,” he said. Gordon’s drive to right off Tyler Danish made it 10-1 in the sixth. It was Gordon’s first home run since July 10 and No. 7 on the year. “I just like the way we’re swinging the bats right now,” manager Ned Yost said. Junis, who is from Rock Hills, Illinois, about two hours west of Chicago, allowed six hits, struck out five and walked three. He surrendered five home runs in 5 2/3 innings in a 6-3 loss to Chicago on April 26 in his first career appearance against the White Sox. Junis was pulled after Leury Garcia’s two-run single in the sixth. Garcia also had an RBI single in the eighth against Glenn Sparkman. The Royals scored in double digits for the seventh time this season. They have won five of their last seven against the White Sox after dropping the first five games in the season series. Royals right-hander Brad Keller (4-4, 3.43 ERA) and White Sox right-hander Reynaldo Lopez (4-9, 4.57 ERA) pitch in the series finale Thursday afternoon. Keller, who turned 23 on Friday, has won each of his last two starts. Lopez is 0-4 with an 8.72 ERA in his last four games.